Photo courtesy of the 1915 Serpentine. According to the 1910 Pathfinder, WCU’s original yearbook, women’s sports at West Chester can be dated back as far as 1891; that was the year of the first annual field meet. 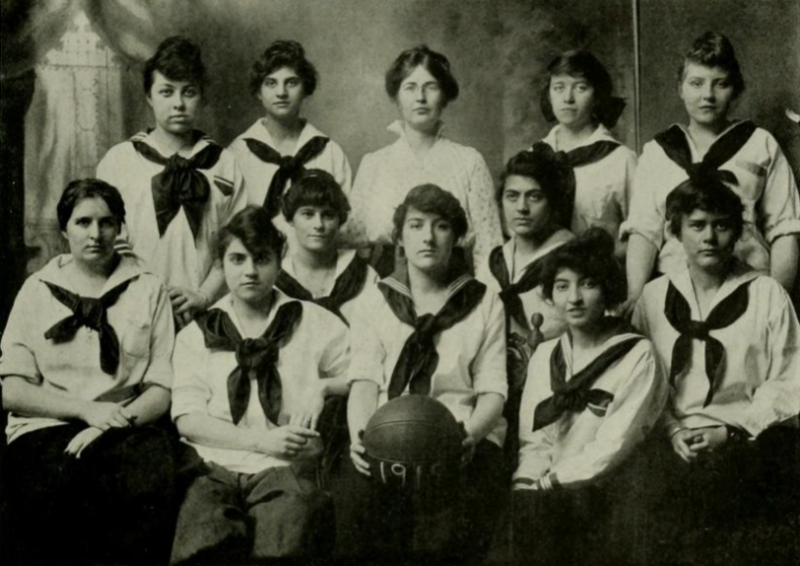 As for organized team sports, the exact date is not known, but in the 1910 Pathfinder, there were three interclass basketball teams which comprised a Senior, Junior and a Middler team. These teams would play against each other in a tournament to decide the school’s champion. The next big change to see was when the Young Women’s Athletic Association (YWAA) first appeared in the 1915 edition of The Serpentine. This gave the women at West Chester a chance to organize women’s athletics at the school. The very next year is when swimming came onto the stage when the first swimming meet was held under the direction of the Girl’s Athletic Association (Originally the YWAA) and in the same school year, women’s dance appeared in The Serpentine. Now, in 1917, tennis and hiking were both activities that were brought up in that year’s Serpentine. In the following school year, Miss Hamilton and Mr. Finnegan got the field hockey sticks for the women. The next decade provided more athletic opportunities as the 1935 Serpentine speaks about new activities on campus which included mass volleyball, ping-pong, shuffleboard, handball, hand tennis, bowling, darts and archery tournaments, then roller skating was added the next year. In 1937, the WAA became a member and officially recognized by the Women’s Division of the National Amateur Athletic Federation. More sports and activities were added in the next year including golf, badminton, modern dancing, tap dancing and fencing. West Chester also participated at the Shippensburg Play Day in that same year. Play Days were days where the women would split up and compete against each other in various physical activities and were the first steps in intercollegiate sports. Next year in 1939, riflery and horseback riding were new activities, and West Chester participated in Play Days at Temple, University of Pennsylvania and Immaculata. There were also special trips for dance demonstration. All-star teams were new as well ,and these teams contained the best women’s athletes West Chester had to offer in each sport. In the 1939 Serpentine, there is a page on “Our Rooters.” This is the earliest sign of what would become the West Chester cheerleaders. The 1940s brought in softball to West Chester as it was mentioned in the 1940 issue of The Serpentine. There were more Play Days that year, but it was slightly more focused as there was a Hockey Play Day at Millersville State Teachers College and intercollegiate play day at Temple. In 1941, the WAA changed their name to the Women’s Recreation Association (WRA), and the other news from that school year would be the organized intercollegiate games/matches that were held: two badminton matches (Bryn Mawr and Swarthmore), two field hockey matches (Ursinus and Immaculata) and one basketball game (Immaculata). Two years later in 1943, there was a push for an improved physical fitness program. This new program had classes focused on field hockey, hiking, active games, swimming, conditioning exercises, bicycling, restrictive activities, speedball, soccer, basketball, fold and barn dancing, roller skating and small games. The next year the WRA had every Woman at West Chester automatically enrolled in the WRA. A few years later in 1949, the Modern Dance Club was organized, and the all-stars were invited to the All College and Middle Atlantic field hockey tournaments at Swarthmore. In 1950, the archery team went to the intercollegiate tournament at Swarthmore and entered the National Archery Telegraph Tournament. Then in 1952, the softball team was in The Serpentine, but they only played a few games since the college did not sponsor a full intercollegiate softball program. West Chester for the first time hosted the annual conference of the Pennsylvania Division of the Athletic Federation of College Women. Miss Carol Keener who was the president of the WRA presided at the conference. In addition to that year there was a Tumbling and Rhythmic Club added. In the 1953 Serpentine, Anita Page is the first person of color pictured as a WRA officer and as the treasurer, she also made the All College second team in field hockey. In 1956, Lacrosse and Synchronized swimming teams are introduced, and in 1959, the soccer team is introduced as well. The biggest move in 1959 was the Women’s Intercollegiate Athletic Program (W.I.A.P.) to conduct Women’s intercollegiate activities. It is separate from WRA, and the sports apart of WIAP were field hockey, basketball, swimming, tennis and lacrosse. Mrs. E. Taylor was the advisor, while Pat Harrison and Margo Stein were the co-chairmen. The 1960s brought the WRA to change their name back to the WAA since the organization now overlooked intramural sports. The WIAP created a sports information committee to provide good public relations about women’s sports. 1961 held the first season of the women’s gymnastics team under Coach Pawlus. Golf would have their first intercollegiate season in the fall of 1962 where they hosted the Eastern Intercollegiate Golf Championships. The next big event took place in 1969 where West Chester basketball beat Western Carolina in the Intercollegiate Athletics for Women (CIAW) National Tournament to win the national championship 56-39. The biggest mark on the 1970s was left by the Women’s Field Hockey team who won four Association for Intercollegiate Athletics for Women (AIAW) National Championships in 1975, 1976, 1977 and in 1978. The first two were won under legendary coach Vonnie Gros and her successor Robin Cash. In 1972 the Women’s swimming and diving team won the DGWS National Championship, and Title IX was established and with that led to more women being involved in women’s sports. During the mid-70s Bill Butler started the women’s track program and coached them as well as the men’s track team. In 1977, volleyball became an intercollegiate sport and in the next fall Women’s cross country competed in their first season as they went undefeated. Then a few years later, women’s indoor track was first mentioned in the 1979 Serpentine. But the highlight of 1979 was the women’s lacrosse team who won the U.S. Women’s Intercollegiate Lacrosse Coaches Association (USWILCA) National Championship over Ursinus. The 1980s were led by Julie Bowers who won three NCAA National titles in track as she won the 5000 meter in 1984 and 1985 and won the 1500-meter indoor race in 1985 as well. In the 1990s field hockey remained as one the of two Division I teams at WCU, and in the fall of 1992, the women’s soccer team finally became a Division II sport after only being considered a club. Then in the 1996-97 season, field hockey entered the Atlantic 10 conference since it was Division 1. Later in the 1996-1997 season, Diane Burkett became the first WCU swimmer to win a national championship. Moving ahead to the 2000s, there were more milestones, the first being Corey Dennis-Knight who was a four-time NCAA Champion, winning both the 100 and 200 butterfly back to back in 2001 and 2002. That same year in 2002, the women’s lacrosse team won its first NCAA National Championship against Stonehill. In 2004, rugby emerged as a new NCAA Division II team on campus. Then, a few years later in 2005, volleyball set the Division II record for aces with 47. Later in 2008, the Women’s Lacrosse team was back on top as they defeated C.W Post in the National Championship game. The 2010-2011 school year saw field hockey become Division II and leave the A-10, but that would not deter them as they would win back to back national titles in 2011 and 2012. The winning does not stop now, and it doesn’t look like it will any time soon as Georgia Wright has won a whopping seven national titles; three in the 1000-yard freestyle (2017, 2018, 2019), three in the 1650 freestyle (2017, 2018, 2019) and one in the 500-yard freestyle (2019). A special thanks to WCU Digital Collections for providing Digital Copies of The Serpentine and the WCUPA Golden Rams, PSAC and NCAA websites for other archival records and information. All were used in the making of this article. Addition: In 2019 Nadia Mulder won the national title off the 1m diving board which made her the first WCU female diver to win a national title.